Hi foodies. I think this is the first time am featuring soya chunks recipe in my blog. Soya bean chunks is a meaty textured veggie which is a great source of protein and fiber. 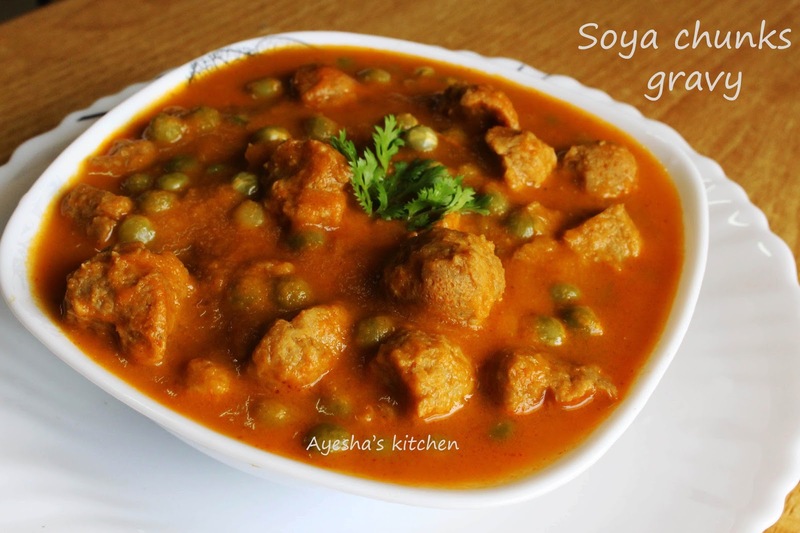 Soya chunks can be served as a replacement for meat in vegetarian dishes. Cooking soy beans is something different when compared to other veggies. No need of any meal maker app for this healthy veggie side dish recipe. I just love adding this veggie meat to chicken recipes too. 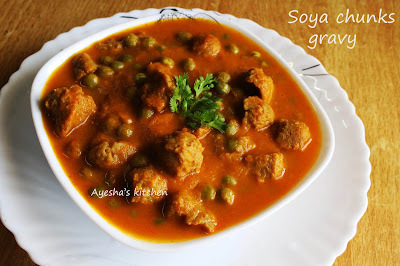 Here am sharing this recipe of soya chunks gravy / soya matar gravy which i adapted from varevah.com and slightly altered to suit my taste. For those green peas lovers here is the soy and peas combo curry which pairs best with chappathi, roti, indian bread, puri and like so. You can also make lots of variety quick meals with this delicious veggie meat like soya chunks fried rice, soya chunks stir fry, soya paneer masala like so. Hope you all will try this easy meal maker recipe soon and drop your feedback. Will try to share all those soya chunks recipes soon (is in my draft). Soak the green peas overnight or can use frozen green peas instead (no need of soaking). Drain and set aside. Now in a pan heat half tsp of oil and stir fry this soya chunks for 2 minutes and set aside. To the same pan, add 3 tbsp of oil and splutter cumin seeds. Then saute ginger garlic pate and once raw smell vanishes, saute onion for few minutes. Then add tomato and cook for few minutes. To this, add all the spice powders and salt . Mix well and cook for 2 minutes. Remove from flame and allow it to cool. Once cooled, grind it to a fine paste and pour it into the pan along with the soaked drained green peas. You can add 1 cup of water if required . Let it cook until the matar / green peas is half done. If u need u can pressure cooked the green peas to the ground mixture or can pressure cook it now before adding soya chunks. When done, add the stir fried soya chunks and mix very well. Cook until done and check for salt.